There is no group with a longer history with Armed Forces Reunions (AFR) than the National LSM/LSMR Association. When working at the Norfolk Convention Bureau from 1983-88 I launched the first national marketing program focused wholly on military reunions – and noticed the formation of the U.S. LST Association. I was invited to speak at their first reunion in Toledo in 1985, and in spite of howls of protest about the old signs in Norfolk reading “Dogs and Sailors Keep Off the Grass,” convinced the 400+ sailors in attendance to have their 1986 reunion in the New Norfolk. There were 1,376 in attendance. I kept a list of reunions that were advertised in the service magazines, and noticed there were no similar umbrella organizations for other landing craft from WWII. When founding AFR in 1988 I decided to plan a first-ever national reunion for LSMers in Norfolk the following year. Notices were sent to hundreds of individuals who’d been seeking shipmates from their particular LSM. 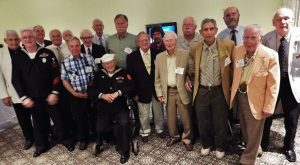 About 100 shipmates attended the June, 1989 reunion, officers were elected, and so began the National LSM/LSMR Association – which just held its 28th reunion at the Best Western Merry Manor Inn in Portland, ME. At their peak they had 1,700 in attendance. In 1989 AFR similarly launched what would become the USS LCI National Association. That same year we began a relationship with the patrol Craft Sailors Association, which continues to this day. Such groups are like family to us. The Featured Veteran this month is one of the founding officers of the National LSM/LSMR Association and a good friend – Dan Riley. 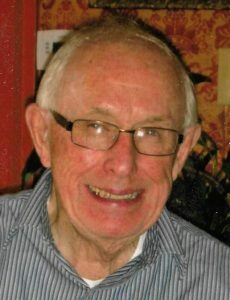 No association was ever more blessed with such talent; at age 91 Dan still publishes one of the finest veteran newsletters in the business: the Alligator Alley. There are two Featured Reunion Destinations this month: Bloomington MN and Colorado Springs. Bloomington has long been a reunion-friendly magnet for reunions. Being home to the Minneapolis/St. 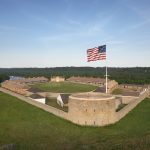 Paul Airport, the Mall of America, and Fort Snelling it’s so easy to get to and such a great location once you’re there. Colorado Springs is not only home to the Air Force Academy, making it a top destination for Air Force reunions, but also home to Fort Carson, NORAD, Garden of the Gods, the Royal Gorge, and Pikes Peak Cog Railway. Not a year passes without AFR booking groups in Colorado Springs – and if you want a deal for your group at either destination get AFR on your side! In Bloomington, you will find every amenity a military group needs to plan the perfect reunion – competitive room rates and complimentary hospitality rooms, along with FREE parking and shuttles. Our hotels are military reunion friendly, offering comprehensive amenities, impeccable service, and reasonable room rates. As Home of Mall of America, Bloomington hosts more than 42 million travelers from near and far, who are making their shopping pilgrimage to the world’s foremost indoor shopping and entertainment attraction. In addition to the mall’s 520 retail shops, visitors can have an outstanding meal at one of the over 50 restaurants and countless attractions including Nickelodeon Universe®, SEA LIFE® Minnesota Aquarium, and FlyOver America. Plus, shopping without tax on clothing and shoes makes the Mall of America experience even more enjoyable – all under one roof. The convenient Blue Line Light Rail will whisk visitors to downtown Minneapolis and the brand new Green Line will do the same to Saint Paul. Hop on the Light Rail easily at Mall of America. The city offers over 40 economy to luxury hotels and 9,300 hotel rooms, which is more than Minneapolis and Saint Paul combined, and impeccable service to all guests. That’s why Bloomington is commonly referred to as the hospitality capital of Minnesota. Hotels provide complimentary shuttle service to and from the airport and Mall of America, and there’s free parking throughout the city. Bloomington is a one-stop shop to plan your Military Reunion. Best of all, this service is absolutely FREE! Click Here to learn more about Bloomington hotels. Unrivaled natural beauty, endless blue skies, unique activities and easy access to the great outdoors all set the stage for the perfect place to reconnect at a military reunion. Come together in Colorado Springs and experience a community that has a rich history of honoring active duty personnel and veterans. Founded as a resort town in 1871 by Civil War hero, General William Jackson Palmer, Colorado Springs is home to five military installations: Ft. Carson, Cheyenne Mountain Air Force Station, Schriever Air Force Base, Peterson Air Force Base, Fort Carson and the frequently visited United States Air Force Academy. Built in 1955, visitors are welcome to tour the Cadet Chapel, Visitor Center, Falcon Stadium and the athletic facilities from various scenic overlooks. During the academic year, see 4,000 cadets in the noon mealtime formation. Reunion attendees can find unforgettable experiences at more than 55 attractions and activities, there’s an endless list of choices to build an itinerary. Popular group tours and attractions include the stunning Garden of the Gods Park. Stop in the Visitor & Nature Center to explore hands-on exhibits detailing the millions of years of history that have created the free, city park. 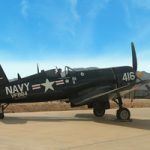 Other activities for your itinerary include the National Museum of WWII Aviation, 4th Infantry Division Museum, Peterson Air & Space Museum and the Pikes Peak Highway. This 13-mile winding road takes you to the summit of Pikes Peak with a view so stunning, it inspired the words to the beloved song America the Beautiful. Located in the geographical center of the United States, Colorado Springs is easily reached from anywhere in the nation. Visitors traveling by auto can follow Interstate 25 directly into the heart of the Pikes Peak Region and Colorado Springs. Air travelers will appreciate the ease and convenience of the Colorado Springs Airport served by the major airlines with non-stop flights to many major hubs – Atlanta, Chicago, Dallas, Denver, Houston, Las Vegas, Los Angeles, Phoenix, Salt Lake City and Seattle. Discover the benefits of reconnecting in this vibrant, affordable destination. Start planning your unforgettable reunion by searching for Colorado Springs hotels HERE. Despite declining numbers, the association’s newsletter Alligator Alley is a well-followed publication, in which Riley – a copy boy at age 16 for the Rochester Democrat and Chronical – shares stories, photos, and columns in a 32-page issue published three times a year. This year he published his first book, “My Life, My Words,” revealing an inside look at some of his war experiences and life in general through memoirs, essays and poems.